Howdy, this is When’s Melee, your favorite weekendly preview of SSBM tourney streams. 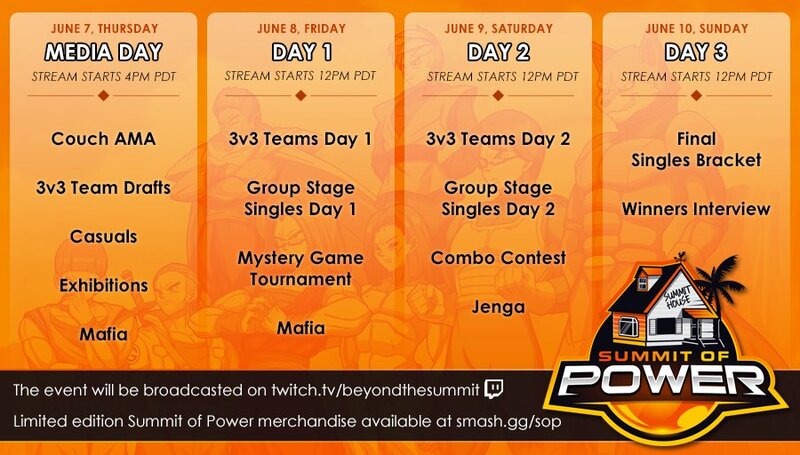 If you know of any other streamed events not on here (excluding weeklies), please give the relevant info on Twitter or here in the comments. Featuring: Hungrybox, Wizzrobe, S2J, Swedish Delight, n0ne, AbsentPage, Gahtzu, Bananas, Uncle Mojo, Magi, Albert, TaylorHJ, Snowy, Tuesday, GP, and some real gamer stuff. Featuring: Mew2King, Ryan Ford, KJH, Slox, RK (but he’s entered as LIT$TAR), Ginger, Trulliam, Nightmare, Heartstrings, Juggleguy, and it’s funny that in order to be canonized you have to be dead but it’s somehow Saints Gaming Live. Featuring: Venelox, Nut, YAMS, CPU, Noire, Shoyo, Kurv, Andymosity, Epic Murloc, Blue, Hulka, Daddy, Jago, Casper, Oli, Tenshii, Nishi, DD, Yung, Devastation, KoDoRiN, F12, and way more players that would be ranked in most other regions. Featuring: Frostbyte, Vintage, The Brig, Puddle, Rhyme, Encore, Hoodcash, Jorge, and the sound of the horsies. Featuring: Javi, Eddy Mexico, Bimbo, Far!, Aza. Pools on Saturday. Sam “also there’s the Summit of Power and that’ll be fun” Greene can be found on Twitter @SSBMDingus.